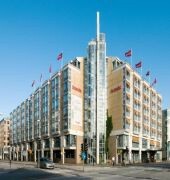 In central Gothenburg, this modern hotel is a 4 minute walk from Gothenburg Central Station. Nordstan Shopping Center is 550 yards away. 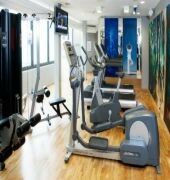 It features free Wi-Fi and city views from its top-floor relaxation center. 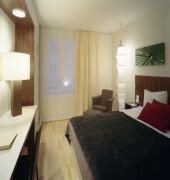 Scandic Crown%u2019s guest rooms all feature Nordic decor with hardwood floors and light wood furnishings. Each room comes equipped with a work desk and flat-screen TV with satellite channels. 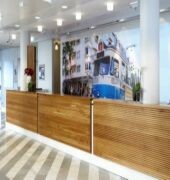 The hotel%u2019s in-house restaurant, Kronan Bat and Matsalar, serves Mediterranean-inspired dishes. Guests can enjoy a drink at the contemporary bar while reading a book from its library. 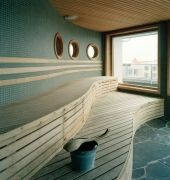 Scandic Crown guests have free access to a hot tub, 2 saunas and fitness center. Bicycles can be rented on site to explore the area. Ullevi Arena is about a 10 minute walk from Scandic Crown. Tradgardsforeningen Park is also nearby, only 220 yards away.